To be precise, we have several features closing the gap functionality with its predecessor QlikView – in total there are three new features and six improvements. It’s interesting to note, although Qlik will never admit to this, that when you read about the content of this release, compared with what came out in Qlik Sense September 2018, you can see Qlik are focusing on functionality to eliminate any reason for QlikView users not to switch over to Qlik Sense. Let’s take a closer look at what I mean. Alternate States enable Qlik users to perform true comparative analysis. With this feature, you can assign a sheet, object, or even expression (using set analysis) to a particular selection state other than the default. 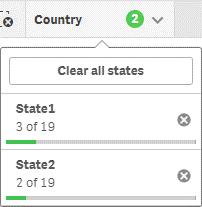 For example, you could make a selection in ‘selection.state.1’ which only affects one half of the dashboard and the other half is only affected by a second (alternate) selection state – ‘selection.state.2’. To create an Alternate State, you must navigate to the Master Item Panel. Once a new Alternate State is created, you can drag and drop it on sheets or objects, or you can add them through the Properties Panel of the respective sheet/visualisation. My initial thoughts on Alternative States is positive and although it is straight forward to implement, do pay attention to the new ways to make selections in Qlik Sense, which don’t exist in QlikView. For example, selections made in the smart search or selections toolbar only apply to the default state and there is no way to switch one selection to another. Therefore, don’t neglect the default state and think about the how your users make selections. Lastly, using Alternate States will most likely require designers to place filter panes on the sheet, assigned to the appropriate states. This is where the Extend Sheet functionality has a lot of use. Placing filter panes underneath the main dashboard view will help keep your sheets clutter-free but still offer quick accessibility. A quick tip, grouping multiple fields into a single filter pane will help improve maintainability. You can watch me walk through the new Alternate States in my vlog. 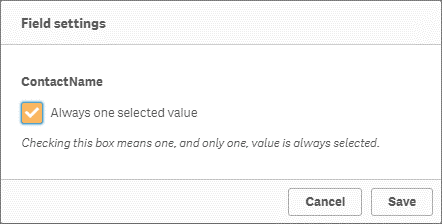 Qlik have finally added the ability to have one value, and only one value, that is always selected. While in edit mode, navigate to the field list to apply this feature and right-click the field and select-field settings. Check the tick box and save… awesome! Note, the value selected at the time the app is published will become the default. You can watch me walk through the new Always One Value function in my vlog. – Custom navigation buttons – for navigating to sheets, stories, websites or perform actions such as making selections. This is useful if your users need a subtle nudge in the right direction. – NPrinting on-demand – a personal favourite of mine. Generate adhoc reports based on your current selections from within the app. – Tabbed container – use tabs to switch between objects, reusing valuable space and prevent littering too many objects into a single view. – Show/hide container – allows conditional show and hide of objects in the container. – Variable input – you can set values with buttons, drop-downs, sliders and input boxes – great for ‘What If’ analysis. To me, this is Qlik snatching a quick win to close off some of those last remaining gaps between Qlik Sense and QlikView. Even if they don’t have the same look and feel as the base objects, this bundle will certainly prove handy for most Qlik users, namely those switching from QlikView. Hopefully we’ll see the bundle transition into the base product in the near future. To me, if you have to interact with a chart to understand what it’s showing, is it useful? I mean, can you tell me what measures those segments reflect? When previously using the opacity function, the entire point or area of a map was affected. 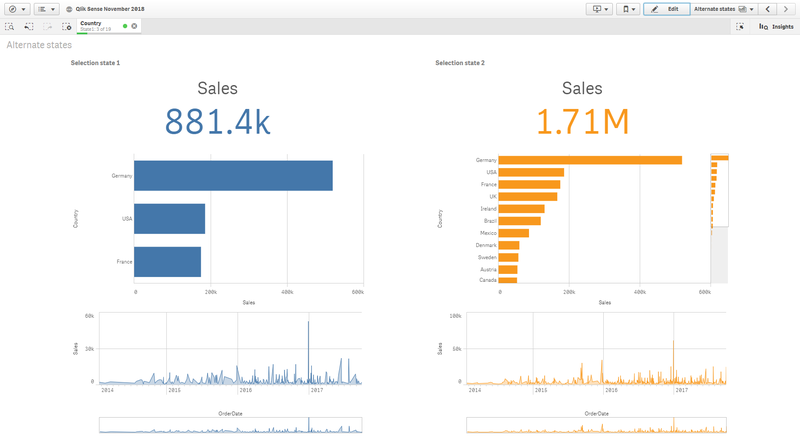 In Qlik Sense November 2018, the opacity is split into outline and fill. This allows designers to make the fill transparent but still show the outline and vice-versa, providing Qlik users with greater control. Bing Maps are now supported by the background layer type in the native map component. 1. The ability to export an app with or without data out of the QMC. 2. Import and replace a published application in one action – great if you have development and test environments. 3. And, when importing an app without data, you can replace apps with sheets and stories without impacting the data or data model – again, this is useful for those with multiple environments. Qlik Cloud Services can now integrate with ADFS and Qlik’s multi-cloud offering now offers simplified configuration options utilising self-signed JSON Web Tokens (JWTs). Accessible list box, keyboard navigation and screen reader capabilities for list box access. 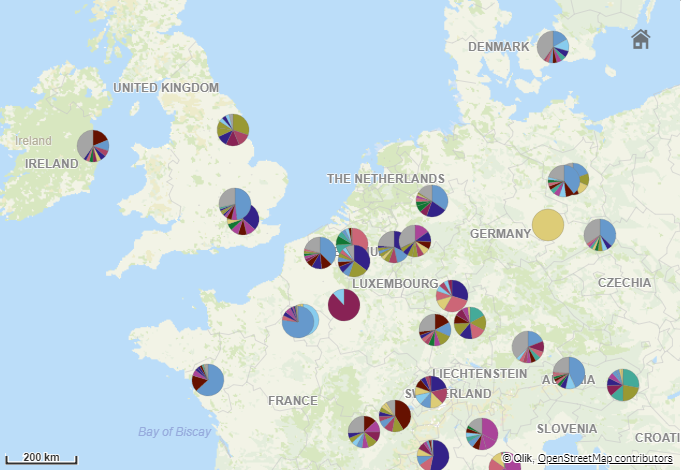 This Chart Layer allows you to plot a chart (pie or bar) by geographical locations. The size of the chart can also be controlled by another metric. This can be used to illustrate the distribution of values and spot outliers in the data-set. However, I am yet to find a practical use-case for it. On another note, this now leaves just the animator layer to be transitioned from the original GeoAnalytics component. Qlik have introduced machine learning in order to leverage information from users’ interactions to feed the Cognitive Engine – exciting stuff! Unfortunately, this is captured over time so it’s hard for me to evaluate the impact this will have now but I’d imagine this will result in the Cognitive Engine becoming smarter to provide more qualified insights. This does highlight a significant leap in technology, which I’m sure will eventually be able to understand how your users like to visualise data, while also adding context around your data to make relative suggestions – something that is difficult to obtain without a completely tailored solution. Light Authoring is one of the channels that feeds into the Cognitive Engine, providing users with the ability to hide generated insights that aren’t helpful. Hidden Assets are still accessible at the bottom of the Insight Advisor, should you mistakenly hide them. Lastly, we come to a new feature in the Expression Editor – Set Expressions. For those who don’t know, Set Analysis is Qlik’s advanced expression language used to aggregate data sets that are different to the current selections. For example, you could limit an expression to always show this year’s sales – even though you may have several years’ worth of data. Previously, you required some technical knowledge to use Set Expressions. However, Qlik have now introduced a feature to include a Set Expression based on your current selections or bookmark. I’d recommend watching my video for a quick understanding of how to use set expressions by clicking here.It’s great for adding individual expressions but becomes quite tedious if you want to create several Master Measures all at once. Therefore, I’d recommend using our Master Measure Generator at OmetisToolkit.com, which is very efficient at adding multiple Master Measures at once – with calendar limitations and more advanced set expressions. In summary, this is a solid release from Qlik to end the year. A lot of gap functionality to QlikView has been brought into the release while improvements to the existing functionality continues. With the introduction of machine-learning technologies, I can see this release laying the foundations for a smarter Qlik Sense in 2019+. It’s an exciting road ahead.